The Berlin-based artist Judith Hopf uses humor and wit to address the politics of art making, group dynamics, and the impact of technology on perception and human experience. Through sculpture, drawing, video, and performance, Hopf playfully anthropomorphizes objects such as laptop computers or ceramic vases by adding facial features, hair, arms, or legs. By animating the inanimate, she imbues it with the potential for purpose and agency. In some works she makes quotidian objects out of absurdly counterintuitive materials, foregrounding the dissonance between a thing’s usual function and its elevation to the status of art. 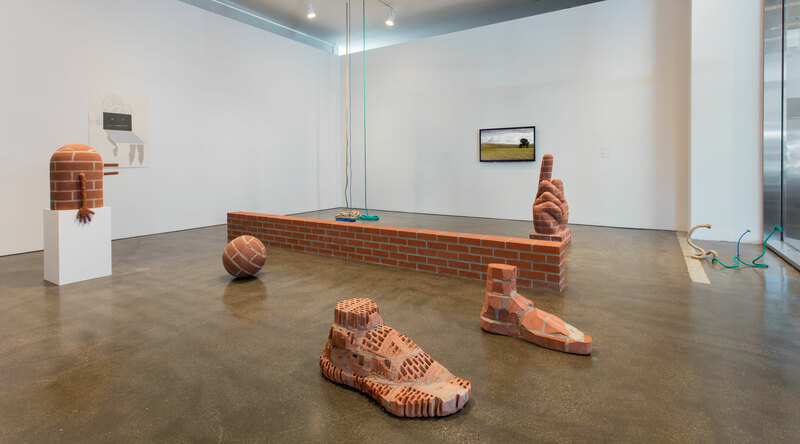 Basketballs and suitcases might be comprised of carved bricks, while pieces of rope and chain links hang and float as finished works that appear complete in their very incompleteness. Her funny, dreamlike video works set ridiculous scenarios against backdrops of everyday life: a girl floods her family’s apartment, a car momentarily flips on its side, and patients dressed like mummies dance to techno music in a hospital waiting room. This is the artist’s first solo exhibition in California. Hammer Projects: Judith Hopf is organized by senior curator Anne Ellegood with MacKenzie Stevens, curatorial assistant. Judith Hopf (b. 1969, Karlsruhe, Germany) lives and works in Berlin. She is a professor of fine art at the Städelschule, Frankfurt. She has had solo exhibitions at Museion, Bolzano, Italy (2016); Neue Galerie, Kassel, Germany (2015); Maumaus, Lisbon (2014); PRAXES Center for Contemporary Art, Berlin (2014); Malmö Konsthall, Sweden (2012); Badischer Kunstverein, Karlsruhe, Germany (2008); and Kunst-Werke, Berlin (2006). Her work has been featured in group exhibitions at La Biennale de Montréal (2016); Museo de Arte Contemporáneo de Lima, Peru (2015); the 8th Liverpool Biennial (2014); SculptureCenter, Long Island City, New York (2014); the Hammer Museum, Los Angeles (2014); Documenta XIII, Kassel, Germany (2012); Kunsthall Oslo, Norway (2010); Kunsthalle Bern, Switzerland (2009); Tate Modern, London (2008); REDCAT, Los Angeles (2007); the Berlin Biennale, Gagosian Gallery (2006); the Museum of Contemporary Art, Chicago (2005); and the Biennial of Fine Arts, Havana (2003), among others. She has had film screenings at the Berlinische Galerie, Berlin (2016); Berlinale, International Film Festival, Berlin (2014); Schirn Kunsthalle Frankfurt (2013); the International Short Film Festival Oberhausen, Germany (2006); American Cinemateque of Los Angeles at the Egyptian Theater (2005); and the Museum of Contemporary Art, Chicago (2005). The German artist Judith Hopf moved to Berlin in the 1990s. Following the fall of the Berlin Wall, the city had quickly established itself as a fertile environment for experimentation and production. Cross-disciplinary in her approach, and equally adept with sculpture, drawing, and video, Hopf was already committed to various forms of collaboration, and she became an active participant in the city’s burgeoning creative resurgence. 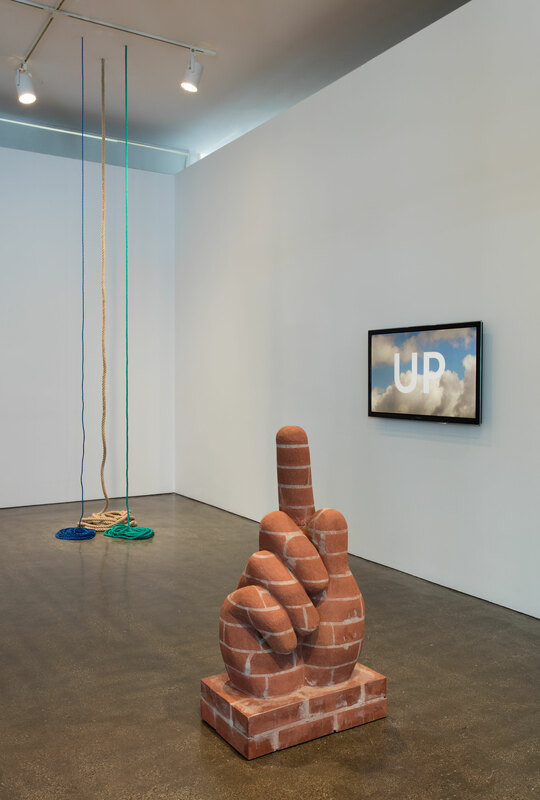 She has grappled with topics such as the expansion of the contemporary art world and the rise of biennial culture, but always with a distinct sense of humor and pronounced wit that results in works that are funny and engaging but also challenge viewers to consider the political and economic contexts within which the international contemporary art world operates. Her sculptures often respond to specific genres or movements in the long history of the medium, such as the portrayal of the body in ancient statuary or the impact of American Minimalism, in forms that make reference to these precursors yet are both refreshingly quotidian in terms of their materials and pointedly un-monumental in scale. The role of technology in how we interact with one another and perceive the world is another point of interest for Hopf, but she resists both a Luddite’s alarmism and a fetishist’s proselytizing in favor of a playful sense of satire. Hopf’s early video works reveal her propensity to grapple with inherited legacies alongside the specificities of the current moment. A video she made with Natascha Sadr Haghighian, Spooky ABC Show (1997), is an absurdist collision of popular culture and academia. In a bookstore/nightclub/DIY space, to a thumping techno soundtrack, Hopf and Haghighian attempt to teach the average German TV viewer terms and ideas associated with post-structural philosophy—specifically the ideas and concepts forwarded by the French theorist Gilles Deleuze—and the Berlin counterculture. The Elevator Curator (2005), a collaboration with the artist and gallerist Deborah Schamoni, is a faux-documentary in which Hopf plays a navel-gazing contemporary curator whose ramblings reveal her anxieties and ultimately her narcissism, ending with her declaring a pile of debris left by three drunk women artists a “living sculpture!” The Elevator Curator is a good-humored jab at the curatorial enterprise, while Spooky ABC Show addresses the shifting social and cultural landscape of a united post-Wall Berlin. 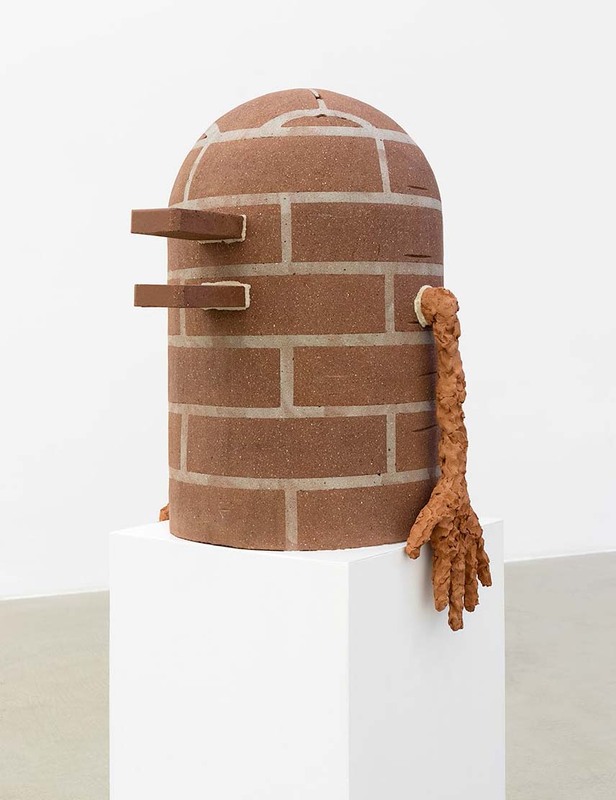 Hopf has a keen material sensibility, and her sculptures are often comprised of supplies one would find in a hardware store such as concrete, rebar, plywood, clay, and bricks. Originally conceived for an exhibition at Kunsthalle Lingen in Germany in 2013, Hopf’s group of concrete sculptures entitled Flock of Sheep was a response to the site, which she viewed as a kind of dystopia where the bucolic countryside is disrupted by a large nearby nuclear power plant. The animals are expressionless and immobile—a gesture, as Hopf put it, “to the flexible society we live in, where we are always ready to move from one job to the next.“1 Recontextualized in the 8th Liverpool Biennial in 2014, the sheep seemed to mimic viewers, who flock together and migrate from one exhibition, fair, or biennial to another. In an adjacent room, ropes were hung from the ceiling and pooled onto the ground or appeared to jump out of the floor like snakes, enlivened and reactive. Vases were tilted on their sides, seemingly submerged in pools of black liquid, and crudely sculpted arms humorously extended directly from a wall. In contrast to the flock of sheep, these sculptures seemed to dissolve boundaries, confounding the limitations of the gallery’s walls. Hopf’s sheep have been installed in several different locations, and in her recent exhibition Up at the Museion in Bolzano, Italy, they shared space with porcelain birds painted jet black (13 Birds Looking Back ) and perched on long black railings, offering, as the curator Letizia Ragaglia suggested, “a parody of birdwatching … turning the viewers into an integral part of the spectacle.”2 Watching us as we observed them, the sheep and birds were positioned next to a curved window, so that the landscape of Bolzano served as a lush backdrop, momentarily collapsing the distinction between interior and exterior. Hopf frequently confronts both the limits and the possibilities of a space, asking us to consider how we maneuver through, within, and around buildings. She has added sculptural “props” to her installations—such as small-scale brick walls, fabric tents hung from the ceiling for viewing videos, and wood framing for a doorway—in order to delineate spaces and control movement within the gallery. Sculptures, too, are positioned and juxtaposed to encourage dialogue among the objects, while also implicating the viewer in the conversation. 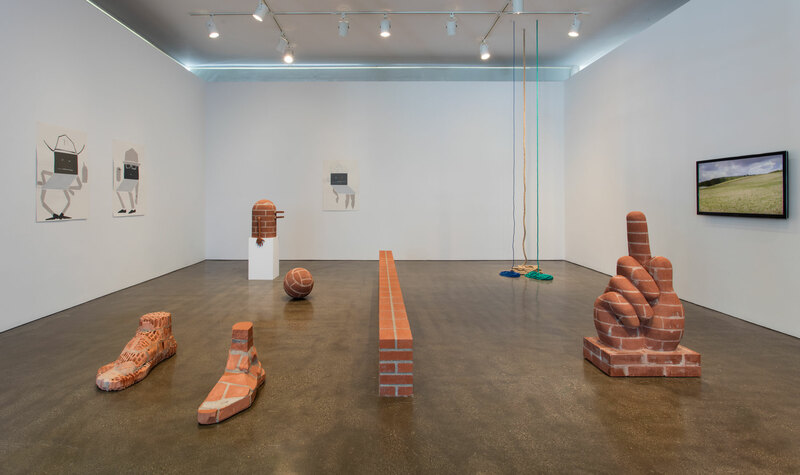 Featured in Hopf’s Hammer Project are a number of recent sculptures comprised of bricks—a material affiliated with architecture and not typically found in contemporary sculpture. In a 2016 interview, the artist associated bricks with the well-known American Minimalist sculptor Donald Judd and his cubes and rectangular stacks made of industrial materials, stating that the “regular, repeating pattern … the perfect lines and flat surfaces … have an inherent Donald Judd–like quality,” making them “technically perfect.”4 Hopf may select a commercially available material and employ the repetition of forms so prevalent in Minimalist sculpture, but she chooses to carve the material, creating objects that are representational rather than geometric and abstract. 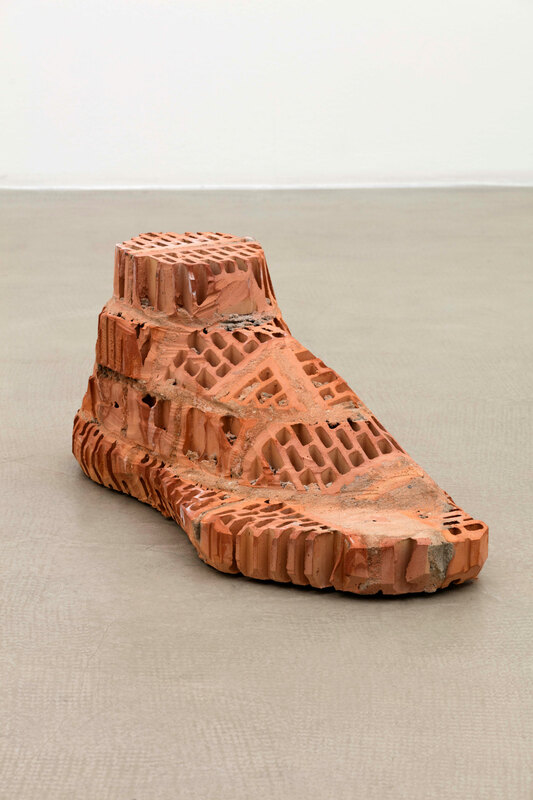 In works such as Hand 1 and her two variations of feet, both titled Brick-Foot (all 2016), the hard edges and regularity of the bricks are undermined by contours, making the works more reminiscent of ancient figurative statuary than midcentury American Minimalist sculpture. 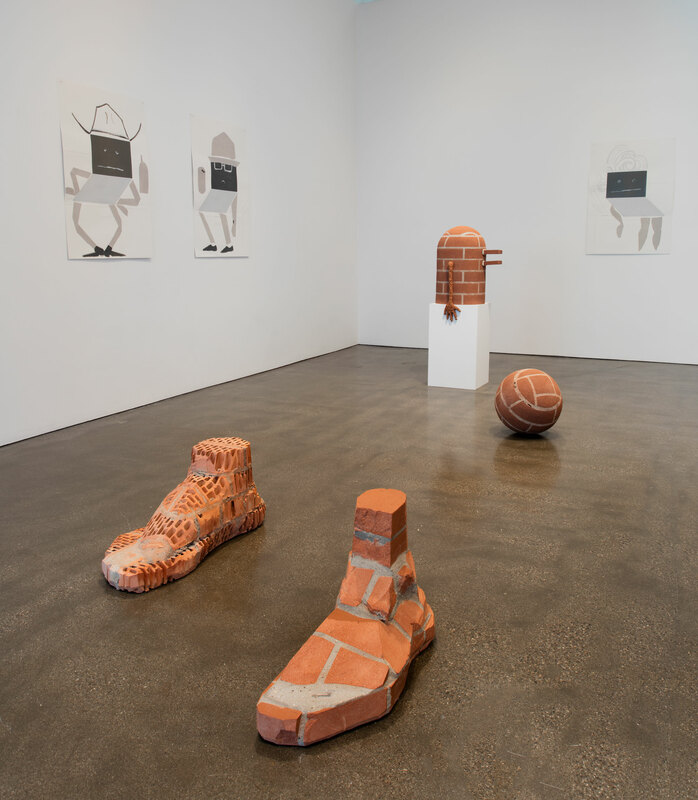 Another brick work from this series—Ball in Remembrance of Annette Wehrmann (2016)—demonstrates the importance of other artists to Hopf’s thinking. A peer, friend, and collaborator, Wehrmann shared Hopf’s antiestablishment sentiments and her playful, and at times irreverent, approach to art making. An homage to Wehrmann, the sculpture specifically refers to a series of soccer balls the now deceased artist (who passed away in 2010) made in 1989/1990 that were lumpen, roughly hewn, and comprised of bricks and mortar. 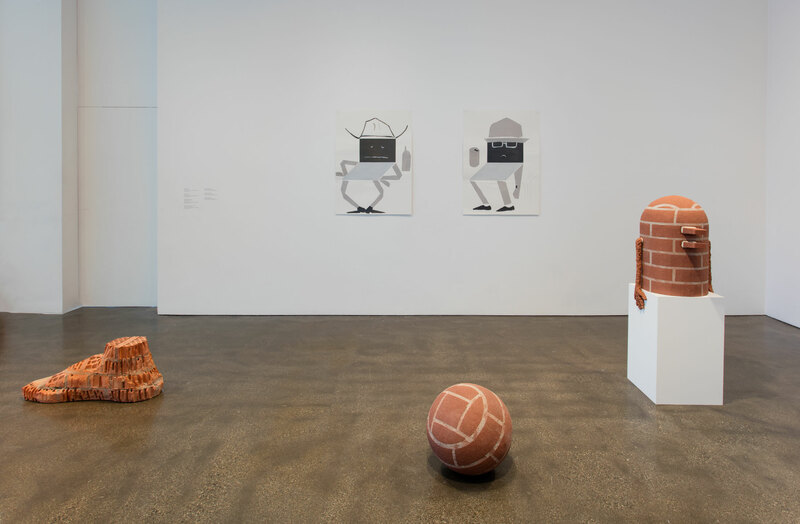 The absurdity and brilliance of Wehrmann’s gesture—making balls out of brick and then attempting to kick them around a room—was taken up by Hopf, whose brick balls have also lost their original purpose and are immobile and static. 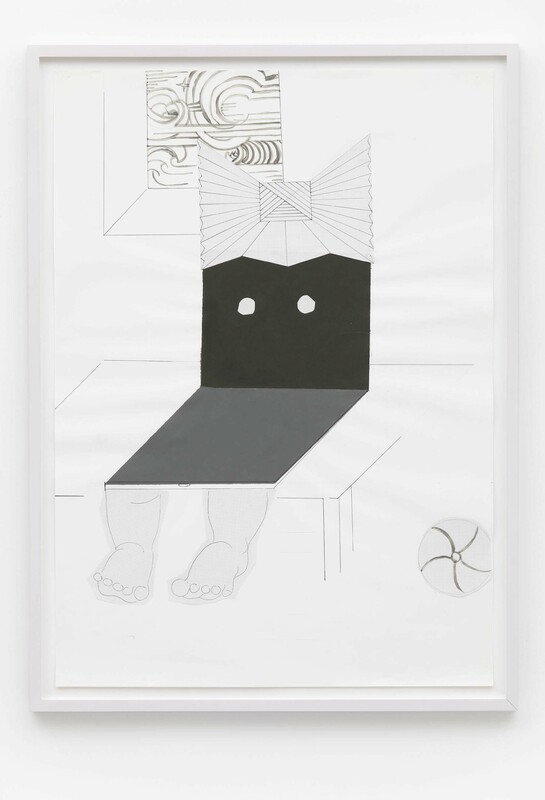 Functionality and agency, as well as an optimist’s argument for the possibility of experiencing the poetic in the everyday, are recurring motifs in Hopf’s work. In the short but absorbing video UP (2017), a car spectacularly balances on its two right tires while driving on a dirt road in the countryside, and only the flora and fauna are there to bear witness to this moment of spontaneous vehicular bravado. Hopf is an astute observer of human behavior, which she mimics and mimes through her distinctive deployment of materials, finding unexpected ways to enliven the gallery space. By animating seemingly inert materials, she suggests the possibility that sculpture may contain an affective disposition rather than being purely aesthetic or intellectual. 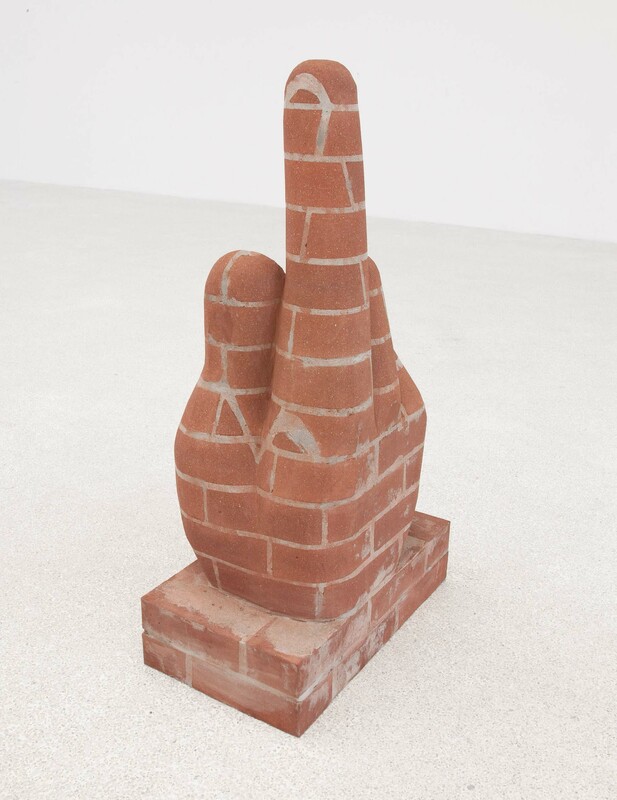 Her works contend with the problems of sculpture: How can it be more active and less stagnant? How can it bridge the ancient past with current ideas about form, representation, and production? To these questions, Hopf offers intelligent and slightly mischievous answers. Her works address the speed with which contemporary society moves, and suggest an antidote to instantaneity and the drive for immediate gratification. She encourages us to slow down, look, and revel in the absurd and the beautiful. 1. Email from the artist, May 5, 2017. 2. Letizia Ragaglia, “Subversive, Sustainable, Physical: The Wry Art of Judith Hopf,” in Up, exh. cat. (Bolzano, Italy: Museion Bolzano, 2016), n.p. 3. In “Postscript on the Societies of Control,” October 59 (Winter 1992): 3–7, Gilles Deleuze addresses the ways in which capitalism, corporatization, and new technologies have contributed to major shifts in Western society and human interactions. 4. Judith Hopf in conversation with Sabeth Buchmann in Up, exh. cat. Hammer Projects is presented in memory of Tom Slaughter and with support from the Horace W. Goldsmith Foundation. Hammer Projects is made possible by a gift from Hope Warschaw and John Law. Generous support is also provided by Susan Bay Nimoy and Leonard Nimoy. Additional support is provided by Good Works Foundation and Laura Donnelley.